When we think about dangerous working environments, images of construction sites, heavy plant machinery, and hazardous substances spring to mind. But it isn’t just these types of working environments that are dangerous. Offices, on the surface, look like safe havens without risk but that isn’t always the case. There are a lot of things that pose a risk in an office, from trip and slips, to fire hazards. To help ensure that your office isn’t falling short when it comes to fire safety, here the most common fire hazards in the office. Almost every office relies on power outlets to keep all the computers, servers and printers working throughout the day. However, not every office has enough power outlets to go round, so they rely on things like extension cords to keep everything powered. This can often lead to extension power pack becoming overloaded with multiple plugs draining one plug. It’s important that you don’t overload an extension cord; the risk in doing so is that it could quickly turn into a fire. Of course there is also the risk of receiving an electric shock if you were to add too many plugs. Neither instance would be desired! Electrical Safety First states that in 2010, there were 6 work related electrocutions across Britain, ranging from low voltage electrocutions to fatal electrical burns. You may also want to consider the expense of broken equipment, should a fire or power surge fry your computer. In many instances, people have lost masses of company data without having a back up available. Office space is at a premium and if your business has spent years in the same place you’ll probably have gathered lots of boxes, paper work, and filing. What you must not do, is store office equipment in such a way that it blocks the fire escapes in your office. All corridors and walkways must be kept clear too. Many businesses only assume they grow out of an office when they take on new members of staff, but in actual fact even a 2 man team needs a bigger space after a few years. If you’re finding you have large boxes of documents lying around after a year or two, invest in new technology to keep important files arranged virtually. Or if you like thing old fashioned, invest in robust filing cabinets and other storage facilities and make sure that your staff don’t neglect using them! Over time, the electrical wires leading from your computers, monitors, lamps, and printers can wear down and become damaged. This leads to exposed wiring which poses an electric shock risk, and spark risk – which can quickly turn into a fire. 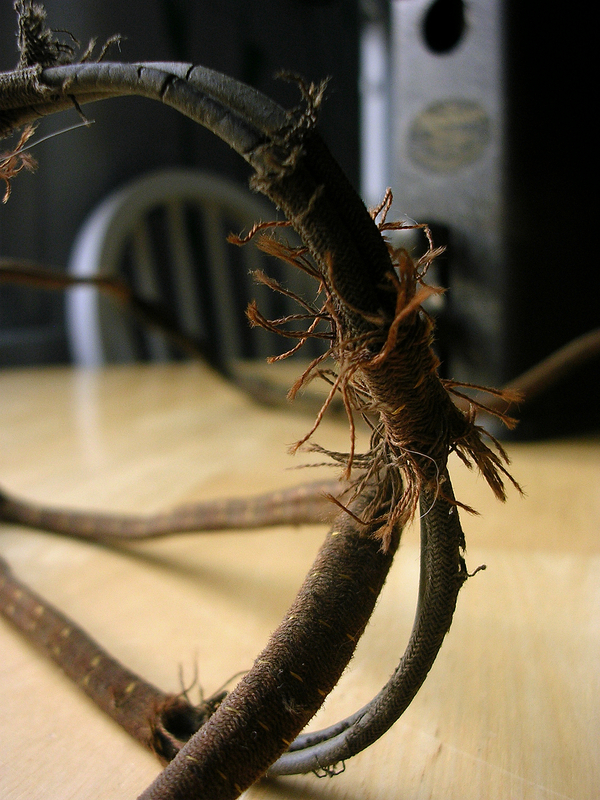 Make sure that you regularly inspect all wiring within the office, and if something has become worn, replace it. As mentioned before, wires can pose a serious risk to staff. An average of 2.5 million electrocutions occur every year in the UK, ranging in severity. You must ensure you are properly storing and looking after equipment. Frayed wires and connection ports that need to be adjusted every now and then to work are not safe. Over time your wires may grate against the edge of your desk. This could cause damage to the internal structure or expose the inside wires by splitting the outside rubber coating. This is more common in offices that arrange desks back to back or up against a wall, trapping wires between two objects. Make sure you have desk grommets that safely arrange your wires. If you find you have a jungle of cables hidden under your desk, take a moment to untangle them and keep them tidy. This is a good opportunity to assess the damage that could have already effected your equipment. Once everything has been untangled, bunch up your wires and keep them together with a cable tie. The office is full of items that can easily fuel a fire – paper, boxes, waste bins, and furnishings. They can all quickly go up in flames. Not to mention adhesives and aerosols. But you can’t completely remove these items from your office; they’re an essential part of what you do. Waste should be collected regularly and secured outside of the building. You should encourage your employees to keep their desks tidy and not to leave paper lying around. And when you choose furniture, make sure that it’s compliant with legislation of fire resistant materials. How regularly do you practise a fire drill? It seems like one of those activities that simply gets in the way of your regular day of work, but it’s imperative that you’re well prepared should the worst ever happen. Unprepared employees become a hazard within themselves if they don’t know how to react in an emergency. Whilst they may not be the sole cause of a fire, they could make the situation worse unintentionally or hold up the process of evacuation. You should have an easy to follow and well practised fire safety strategy in place to avoid any issues from arising. On a final note, make sure that you have the correct measures in place in case of a fire. All employees should have adequate training and know exactly what to do; there should be sprinkler systems installed; and the correct fire extinguishers stored in various areas of the office.